Please be sure to ask your doctor before using this method as it is an off label use. If you have a spinal cord injury then I'm sure you have had to deal with a UTI at one time or another, but for some, it is a constant battle with UTIs. Within the two month period of me being in the spinal cord rehab facility, I had 3-4 UTIs and that had qualified me for a completely sterile, closed system catheter to be covered by my insurance provider. Although I was happy to qualify for these catheters, the reason I did qualify was not something I wanted. After using these closed system catheters for multiple months after leaving the hospital and taking extra precautions to keep things completely sterile, I was still dealing with a UTI almost every other week. My urologist didn't want to keep giving me antibiotics, giving the bacteria the chance to become resistant, so I began to do some research on my own. There are many kinds of catheters and many that are a completely sterile process, but how can a completely sterile process still allow me to get UTIs so often? This is when I decided to take another person up on their offer to give me advice about their method of cathing. The advice I received was essentially life changing! This person that offered me advice also had a spinal cord injury and lived in my small village. I contacted him and we set up a day to meet and discuss things. While we met he explained to me the method he uses for intermittent cathing and told me he has gone many many years without a UTI using this method. After hearing this I was hoping I would get the same results. He even bought me most of the supplies I needed to get started. What a generous offer, not only did he give me essentially life-changing advice, but he also gave me the supplies to get started! This method seemed crazy but it had proven results. First off I will list the items for the original method I used which was exactly the same as the person's method that explained it to me. Now for the original method. -The first step: wash your hands with the hand soap and shake any excess water off. -The second step: get a new catheter and open it up. Dip the end into the betadine. -The third step: put hand sanitizer on and shake hands to let them air dry. -The fourth step: take the catheter and insert it as you normally would any other catheter. The betadine acts as a lube and also kills germs. Empty your bladder into the urinal or container. The fifth step: once you are finished urinating remove the catheter and rinse it off with water. The sixth step: put the catheter into one of the plastic continers with about an inch layer of the alcohol in the bottom. The seventh step: after you get a few catheters built up in the container with alcohol, transfer them into a dry container. Then you can use the catheter again. I would use a cycle of catheters for up to a couple weeks as long as they appeared clean. As I mentioned this is the original method I was taught and even with reusing the catheters I had eliminated my problems with UTIs. I was confused because this method seemed completely unsterile. Before this, I had never touched the catheter with my bare hands. This original method would work great for someone who has to buy their catheters out of pocket because you greatly reduce the ammount of catheters used. Also, a tip for using this method on the go is to have a third container with clean catheters (out of the alcohol) in. Then once used, put them into a resealable bag and rinse them once you get home. Then put them into the alcohol container. How I modified the method to suite me better. I used the above method for quite a while until I was getting low on straight catheters (ones that were sent home with me originally from the hospital). Once I knew this method worked for me I called my catheter supplier and changed to a regular straight catheter. Now I will explain to you how I modified this method to suit me better. I had my catheters being covered by insurance so reusing them wasn't necessary for me. This modified method also has way fewer components to it and even eliminated the need for a urinal. -The second step: open the other end of the catheter packaging to create an "extension" for the catheter. -The third step: apply hand sanitizer and shake dry. -The fourth step: take catheter from the betadine and begin to insert it. before it enters the bladder take the packaging and put it over the end of the catheter and use it as an extension to reach the toilet or even the ground if you are outdoors in a private area. -The fifth step: remove the catheter and extension and throw it away. With my modified method I have eliminated washing your hands, reusing catheters, and the need for the containers and alcohol. I have only had a couple UTIs since using this method and it's going on 2 years now. This is a great improvement over every other week. Also, I would like to mention a tip for carrying the betadine with you. I put some into a smaller cylindrical continer with a lid that pops open and it has a small hole the catheter just fits through. This helps for if I were to accidentally drop it, it wont all spill out instantly. 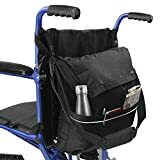 I always keep it inside a resealable bag to keep it from getting on things in my wheelchair bag if it were to spill. Betadine is a dark brownish-red color so it can stain, although when I have spilled it on lighter things it seems to come out fairly well. I do keep a container with me still in case I cant access a toilet and I'm not in an area I can go outside. I hope this method can help people struggling with UTIs. I really hope that me sharing this method helps someone out there that is struggling with UTIs. I really suggest asking your doctor or urologist first. I asked my urologist after I had already switched to this method and he told me as long as its working that I could continue. This may not be for everyone because everyone's body is different and if you have limited hand control it may be difficult. The person that I mentioned learning this from is a quadriplegic and had loss of hand control, so it is possible to use this method as a quadriplegic if you are good with using your hands without function. I would also like to mention that this method most likely won't help you get rid of a UTI if you already have one. Clear out the infection first and then try this method if you would like. Hello, I am a T12 incomplete paraplegic. My injury is from a motocross crash in 2016.